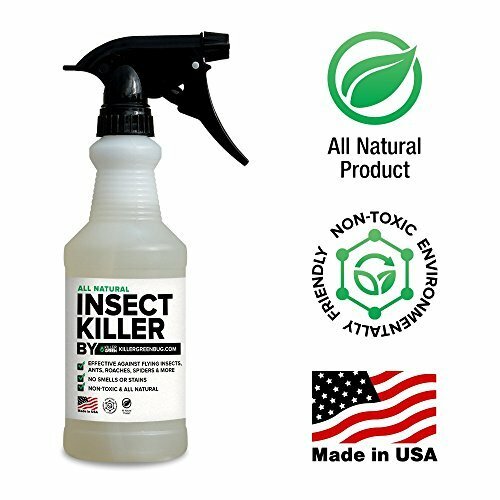 The latest in safe green products to control common household pests and insects All Natural Non Toxic Insect Killer by Killer Green kills many common household pests - from roaches to spiders to ants to mosquitos - without putting people pets or plants at risk. Make the safe choice the green choice to protect your home and family. Our Insect Spray Kills EGGS LARVAE and ADULTS. Better then spectracide, great for your backyard, and is safer than any chemical. Our insect killer breaks down the insects exoskeleton until liquefaction occurs and the insect dies. It takes up to 10 minutes for the bug to die. WE GUARANTEE OUR PRODUCTS or your money back. We believe in karma and we have tested our product and know it works. If for whatever reason you are not satisfied then send it back to Amazon and we will refund you no questions asked. We appreciate your business! SAFE TO UESE AROUND THE HOME AROUND YOUR PETS PLANTS AND KIDS. KILLS LARVAE, EGGS AND ADULT INSECTS BY BREAKING DOWN THE EXOSKELETON - properietary formula breaks down their exoskeletpon until the bugs liquify and die. It does not kill on contact but will kill after a few minutes. NO CHEMICAL LIKE SMELL - very light smell and dissipates quickly. What this means you can spray outdoor as well as indoor and it wont have that toxic smell like triazicide makes. SAFE AROUND KIDS PETS AND PLANTS - Safe to spray around the home and works only on the insects. Feel good about spraying indoors around pets plants and children because our product is organic and its not dangerous like a lamp, bulb or zapper. USE INDOOR AND OUTDOORS - ok to be used inside the home or in the garden or around the home. Great on the lawn and you dont have to leave granules that possibly pets could eat. 100% MONEY BACK GUARANTEE - If you are not fully satisfied with this product we will refund your money no questions asked. If you have any questions about this product by Killer Green, contact us by completing and submitting the form below. If you are looking for a specif part number, please include it with your message.